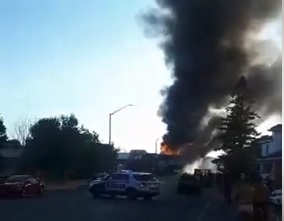 Cornwall Ontario – Another major fire in Cornwall Ontario. Another round of appeals for help from “victims” who’ve lost everything. It’s tragic, but for many it’s a self inflicted wound that also impacts the community. In Ontario renters insurance can be had for as little as $15 per month. That’s a package of cigarettes or for those that black market it from our First Nations friends, a bag of ciggies. That’s a six pack of beer. Insurance is mandatory for social housing and for many larger complexes, but in our East End, where many older units cater to those on limited incomes there is no insurance regulation and many times multi unit buildings are wiped out due to fire. Surely that’s worth the value of losing everything you own, as little as that may be, when tragedy strikes. And tragedy strikes the poor far more often than the less poor. Here in Cornwall we don’t see epic fires in Riverdale. We see them in the building dense sections of the East End known as le village. There simply is no real answer as to why so many in Cornwall “CHOOSE” to not have insurance? It’s boggling. And if you refuse to donate to help these victims you’re considered a nasty. This writer is all for helping those in need, but if people won’t take the very simple steps to protect themselves do they really warrant that help with many of us having limited resources? Shouldn’t the help go to those that truly need it most? Is this a subject that rarely gets talked about simply because it’s about the impoverished who rarely have a seat at the political table? What do you think dear CFN viewer? You can post your comments below. Insurance should be the law. Plain and simple. Although I find your wording a bit harsh especially with the whole “victims” though. Still, I can’t comprehend how someone cant have house insurance. People need to protect themselves! Helping people shouldn’t be conditional upon whether or not you feel they deserve it or not. Some people act or don’t act out of ignorance, some people act or don’t act out of fear or lack of, etc. It’s always easy to be in a position to judge. If one cannot or does not want to give, fair enough, but why kick a person when they’re already down? Our last mill burnt in 2010; it cost the city tons for firefighting, investigating, cleanup, police etc. That mill was supposedly to be converted to condos (but no plans or drawings it seems), yet it had no security, no fire alarms, no fire suppression — no reason not to burn down to speed new construction without the trouble of heritage designations and demolition. Forcing people to protect themselves… doesn’t that drive the cost of the protection racket? Insurance should be voluntary. Forcing it upon people is unethical. Fire strikes the poor more than the well todo?I would think that one over if i were you. I agree. Insurance is cheap enuf. I do know of even lower insurance rates of around 7$ to 10$ that will get you 5000$ and accommodation for a couple weeks in a motel until you get going. This is better than starting over from 0$ and no place to go. Losing everything is bad, but having nothing when it happens is worse, especially when someone could have done something about it. Bridget there’s a double edge to your position. If owners brought them up to standard then rents would go up to standard too. Many of the current tenants couldn’t afford market rents. Not all homes in the East End are derelict, but most of the substandard housing are the only financial options for many in Cornwall. It’s not an easy issue, but for as little as $15 per month at least families would be protected to some degree when tragedy strikes. One issue is building codes. Buildings only have to meet the building codes from the date they were built, not the current building code. If major renos are done then the newer building code would prevail. And as Admin pointed out if they were brought up to code many wouldn’t be able to afford the new rents. Catch 22 at its best!! Hugger that’s where renters complaints to by law should come into play. Or via the Landlord Tenant board. Sort of. As long as the property is up to code when the house was built there is not much bylaw, etc can do. We found this out when we sold my mom’s house after my dad passed. As long as it met the code the year it was built we weren’t required to update it.